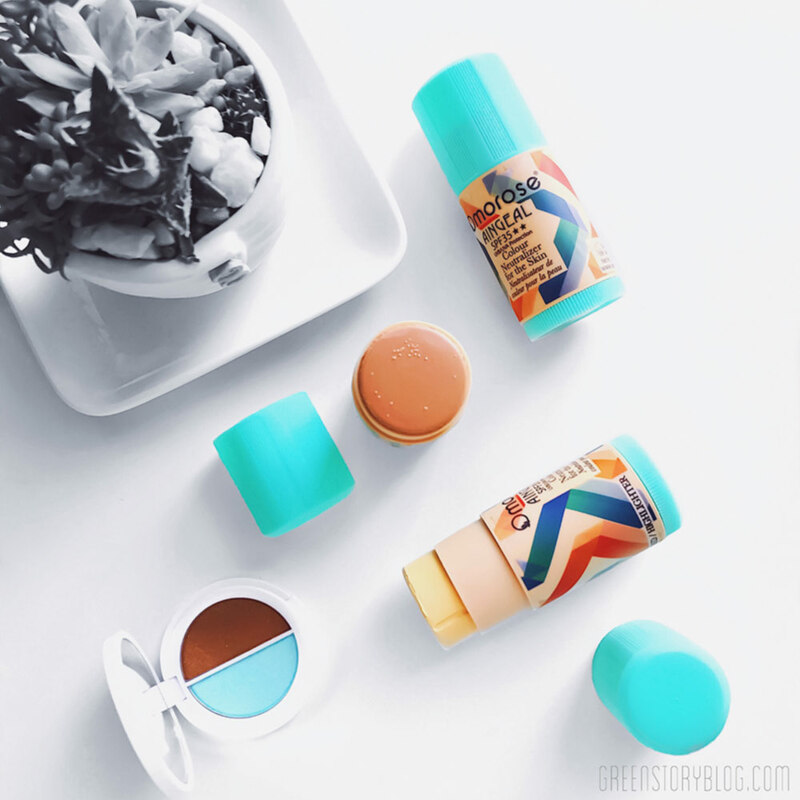 Omorose Cosmetics – A Malaysian Makeup Brand | Yay or Nay? Omorose, the ancient Egyptian word means Beautiful. This Malaysian brand (made in Taiwan) was founded in 2014 by Terry Liau, a make-up artist specialised in Prosthetic Makeup and Special Effect Makeup. Omorose ensured the quality and safety of their product by using only natural preservatives where needed. Harmful components like parabens, phenoxyethanol, phthalates and mineral oil are excluded from their ingrediesnt list. This is also a cruelty free brand. These neutralisers claim to be an all time companion for an even skin tone. These come with two universal shades, X Blue & Brown (Light Coral) and X Red/Highlighter. They also contain SPF 35++ UVA / UVB protection. Apply directly to the skin, before foundation if you want to neutralize uneven skin tone. Blend into the skin with fingertips or a brush, and allow 15 to 20 seconds for it to set in. Set with a setting powder for a long lasting result. I love the X Red/Highlighter one most as I don’t have much uneven skin tone issue. This has a yellow tone in it. I apply it over my foundation, around my undereye are to highlight it. It gives a nice brightening effect. I love that the BB Foundation Stick has SPF35, UVA/UVB protection in it. It comes with 3 different shades for fair to medium skin. One stick contains 20g of product which is quite a lot. A stick foundation is always convenient to use and travel-friendly. Initially, I thought the shade Medium-Tan will go with my tan skin and I was very excited about it. Sadly the shade turned out way lighter than my skin (my skin shade ref) to use it. Hope Omorose releases more shades of this BB stick in future. This is a colorless fine finishing powder. The pot comes with 6g of product and a puff applicator. They have two types of this Styn Finishing powder, one is matte and one is this one, Diamon, with some kind of shiny specks in it. I picked diamond for me. Needless to mention, the shiny specks in it caught my eyes. Although I couldn’t really capture this shine it has and gives when applied but I like the effect on the skin. This finishing powder gives a complete matte yet satin overlook on the skin and locks other product, like foundation or concealer, very well. I would suggest applying it as the last step of your makeup because once you set your makeup with this powder you won’t be able to move anything else later. Hypnotic Eyes Silky Eyeshadow Duo has 3 shade varieties as far as I remember. I loved the brown and light blue combo the most so picked Aishwarya for myself. Both shades are nicely pigmented and satin in finish. The blue shade has sorta duo chrome effect (pictured above) which I love. They claim to have Vitamin E in them to help prevent signs of aging, and also crease and fade resistant. I found them to be pretty long lasting on my eyes without any eyeshadow primer or so. This shadow duo is my most favorite product among all Omorose product I have. This is a gel blush tint that looks like totally a lip balm to me! This is not alike other cream blushes but very lightweight and thin in texture. Although it applies thing but gives just the right amount of tint. They have 5 shade variety, I got Pretty Jessica, a vibrant rosy pink. Works better if you apply directly on the skin and blend with fingers and set it with a setting powder afterward. I use it as a go-to lip tint as well and works fine for y lips. These are your regular tinted lip balm, comes in 7 flavors and shade. The twist up tube contains 5g of a product. I got the shade Raspberry Smoothie and watermelon. These balms are quite nourishing on the lip because they’re enriched with coconut oil, avocado oil, argan oil and Vitamin E. I like that these balms don’t slide off from the lips and gives a nice tint, however, I’m not a fan of how these smells. You can buy Omorose product directly from their website (offers international shipping). They also have dedicated outlets in 1Utama and other places like that. Overall, I did enjoy trying out Omorose product. Their product quality has nothing to complain about. Although I feel their price range is a tad high. I also wish they had more shade in their foundation range. Yes, you at least try their eyeshadow, wink! *** These products were sent to me complimentary for reviewing purpose. However, all thoughts are my own based on my own experience. They’re new to me as well. but I just can’t ignore how cute they look!